Fender has unveiled a sparkling limited-edition Precision Bass to accompany Artform, a short film by the brand that explores the future of analogue. 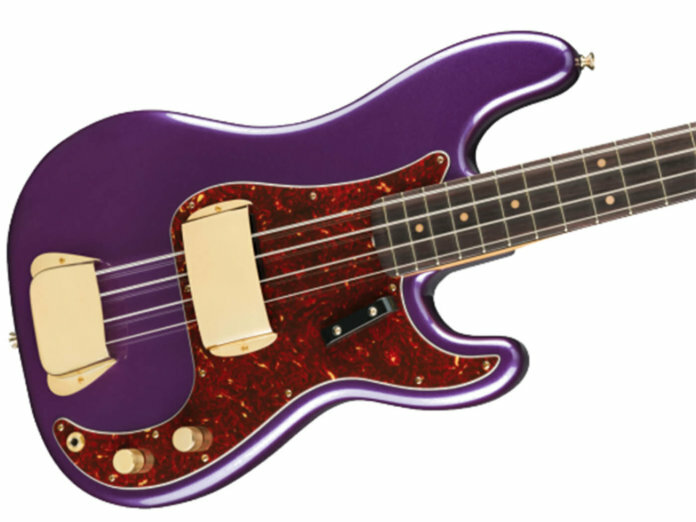 Dubbed The Midnight Hour, this bass is named after the moniker adopted by the film’s stars: Ali Shaheed Muhammad and Adrian Younge. The duo are known for their jazzy take on hip hop – and you may also know Muhammad as a member of A Tribe Called Quest. Back to the instrument, the alder-bodied bass is coated in a handsome Purple Sparkle Gloss finish, complete with a matching purple shell pickguard. It sports a “1963 C” maple neck and a rosewood fingerboard. The bass is loaded with ‘Pure Vintage’ ’63 split-coil Precision Bass pickups. And you have your standard P-Bass volume and tone knobs – knurled flat-top versions – to work with here. Elsewhere, the bass boasts vintage appointments such as a heel-adjust truss rod and a threaded steel saddle bridge. The ‘Pure Vintage’ reverse open-gear tuning machines, pickup cover, and neck plate – engraved with the duo’s band name – are all gold-plated. Pre-orders at $2,395. More information at linearlabsmusic.com.